But, alas, I was at home with my kiddos on a Wednesday afternoon and hadn’t been to the grocery store in days. Could we still have yummy, garlicky, buttery shrimp for dinner in less than an hour? Here’s the secret: Always keep a bag of raw, peeled and deveined shrimp in your freezer. But wait, frozen shrimp? Wouldn’t it be better to get that fresh-looking shrimp from the supermarket seafood counter? Actually, no. Plus, a bag of frozen shrimp is just REALLY handy to have around. So I try to keep one in my freezer at all times. The bag pictured above is from Trader Joe’s freezer aisle (and is really tasty), but there are great frozen options at other grocery stores, too. — Look for a bag of “raw + peeled + deveined” shrimp because not having to peel and devein at home will save you a lot of hassle. — “Tail on” shrimp looks fancier, while “tail off” is easier to eat and is usually a bit cheaper, but either one will work just fine. — Twenty to 30 count per pound will give you good-sized medium shrimp. (Less per pound means bigger shrimp, and more per pound means smaller.) I generally stick with medium-sized shrimp because they fit well in tacos, are great for one-dip dipping, and are cheaper and easier to share with a crowd than the really big guys. — If you have frozen shrimp in your freezer, you can defrost it overnight in the refrigerator. When you are ready to cook, rinse the shrimp in cool tap water. Then use paper towels to dry the shrimp thoroughly before cooking. — Or, you can “quick defrost” the shrimp in about fifteen minutes by doing the following: Place the frozen shrimp in a large bowl. Fill the bowl about half-full (enough to cover the shrimp) with cool tap water. After about ten minutes, drain the water into the sink and add fresh water to the bowl. Let shrimp sit in the fresh water about five or ten more minutes, or until shrimp are thawed. Drain water thoroughly. Use paper towels to dry the shrimp before cooking. To cook the shrimp, all you need is butter (or olive oil), garlic, and S&P. Pretty simple, right? Great tasting shrimp really is that easy! Here’s my recipe along with several serving ideas. Hope you enjoy! Melt the butter in a large pan over medium heat. When the butter starts to melt, add the smashed garlic. Swirl the melted butter and garlic around the bottom of the pan. Cook the shrimp about 1 minute, or until you start to see pink on the edges. Then flip the shrimp and cook for 1-2 minutes more, or until shrimp are bright pink and opaque. Transfer cooked shrimp to a serving platter. Season with salt and pepper. Repeat cooking process with remaining shrimp. Transfer second batch of cooked shrimp to the platter and serve! 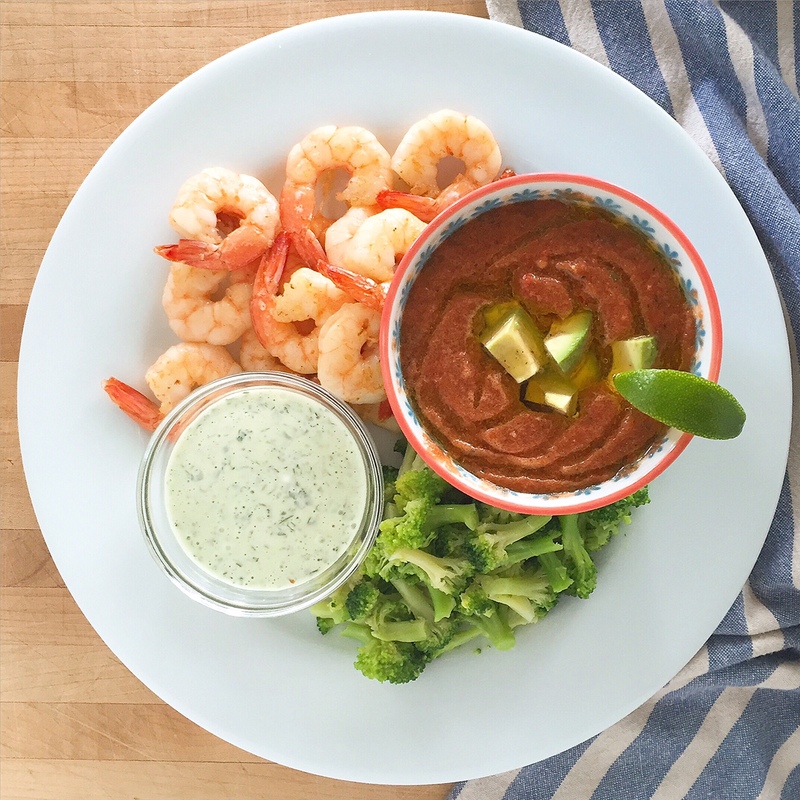 — Serve the shrimp with a bowl of Best-Ever Cilantro Lime Sauce for dipping. This is so much better than ice cold shrimp and cocktail sauce, trust me! It would be perfect served as an appetizer at a party, or as part of a casual al fresco dinner. — Serve the shrimp on or in a big Caesar salad. In the picture below, I put the shrimp onto small wooden skewers after cooking, but feel free to just toss them in freely with the salad. For the Caesar dressing, I use Cardini’s Original Caesar dressing (it comes in a jar at the grocery store), a big squeeze of fresh lemon and plenty of freshly-ground black pepper and grated Parmesan. Yummy, easy and healthy! — For shrimp tacos, remove tail and wrap shrimp in warm tortillas (or a butter lettuce leaf for a low-carb / gluten-free version). Top with shredded cabbage, crumbled or grated cheese, chopped tomato, sliced avocado and a big helping of Best-Ever Cilantro Lime Sauce. 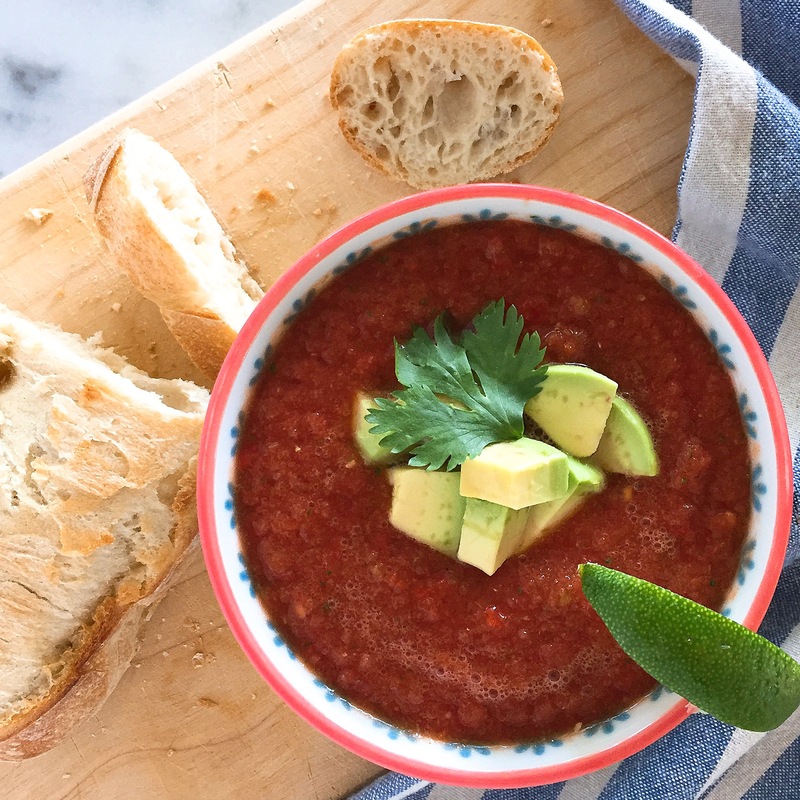 — Serve the shrimp alongside this Easy Summer Gazpacho, with a small bowl of, you guessed it, Best-Ever Cilantro Lime Sauce for dipping. You also can drizzle a little of the Cilantro Lime Sauce on the Gazpacho for a delicious creamy topping! How do you serve shrimp at your house? I’d love to hear your ideas!